This is the biggest challenge we’ve EVER done. I’m personally committing to doing 100 reps of a unique ab exercise every single day, for 30 days. And guess what? I’m going to go the extra extra EXTRA mile and give you something I have NEVER EVER done before. I’ll be uploading 30 workout videos in 30 days. 1 video for day, per move. Take a before picture and an after picture! As long as you’re eating clean and drinking tons of water, you will see and feel a difference at the end of the challenge! Use #100abchallenge if you post anything along your journey! This will help us all stay motivated and connected! Track your progress with my Coda doc here! Anywhere! You can do all these moves with no equipment! Print out this printable above and hang it on your wall and also head over to YouTube.com/Blogilates to watch my daily video showing you EXACTLY how to do each move! I’ll also suffer through the 100 reps with you! AHHH!!! Are you ready!!?? This is SO EXCITING! I AM PUMPED! I’ve never done 100 reps of a lot of these moves, so I am curious to see how I will do! Also, if you want me to collab with a particular person, comment below and tell me who! GOOD LUCK!!! Now, type “I’m in!” and share this post with at least 1 friend! Love these! I tried some of these ab workouts out after taking my Superior Labs supplements and I was feeling it for sure! Such great workouts! My boyfriend and I have decided to start this Ab Challenge together. Long distance btw. We start May 1st after my finals. So excited!!! I dont understand. Meaning, example for day 1 exercise. Count until 100? Like that? I’m in! Already did day 1! i dont know. nut i’ll try my best. i’m in. I hope i can finish this journey with great result so excite! i started the 25th of march i just finished the wiggle and my abs hurt and my upper legs hurt from the double leg lift yesterday but other than that i feel great! Hi. I have a problem. I cant open workout calendar March 2019. Its problem on the website??? I’m so ready to start!!! IM IN!!! I NEED to tone my abs NOW!!! I’M IN!! really want to work on staying in shape and this is just what I need!!!!! Well done for putting out this post. Its a very good incentive for people to move their bodies by exercising regularly. I’M IN !!! Will need a lot of motivation, but i’ll get there ! i watched your video very inspiring i have the same insecurity but I am definitely bigger than you but this new years i decided to myself that i would be healthier i have also been through some rough times this year and the end of last year it was rough but I got through it and now I want to be healthier I am starting ballet as one healthy step in the right direction so I AM IN!!!!! I wanted to start this challenge last month but i talked myself out of it but now i have completed my 4th day and i can already feel different, There is no physical difference yet, but doing this challenge is to prove to myself that i can stick to something for 30 days and not give up (and also to lose some weight). Goodluck everyone! Please don’t cry Cassey! Yor’re very beautiful, and I wish I had a body like you! I tried to achieve it for my Wedding Day, but I did’t. I would be very happy to have a little bottom belly like you do! I have struggles on having a clean diet. I love yummy sugar stuff, unfortunately. I just wanted you to know that you are an inspiration for me! You look amazing! I’m in!! Super late, but whatever!! I’m in! Just watched your “I did 10 ad exercises…” video. It was emotional and moving; I dislike the same area on my body. We will see how it goes. This has been amazing! I am feeling results. I’m disabled and I know I can do these in the water at my recreation center. I will give it a try. So I found out about this challenge late… and decided to started on february 1 … Day 1 here I come! Me too, it’s okay we are in this together! We’re done now what? ;(This was totally inspiring! Thought we had one more day 31st, but :( restarting the challenge myself for February! Just found out about this but I’m in! I’m in!! i hope the calendar doesn’t get taken down at the end of the this month, b\c i’m late to show up! I’ve only just seen this so I’m starting late but committing to your challenge. Bring on the abs!!! I discovered your 7 minute videos a week ago and have been doing them… I love that they are short so I can fit into my busy schedule …and to soon get my pre-baby body back. Thanks Cassey. I just started on your beginners calendar and I have already on day 19 seen so many changes. I have lost 4 lbs and improved on my right hip pain. What was hurting so terribly before is now becoming bearable. I didn’t realize how weak my muscles and ligaments and tendons were near my joints causing me so much joint pain. I have embarked on this journey and am so excited to get stronger everyday watching your videos. 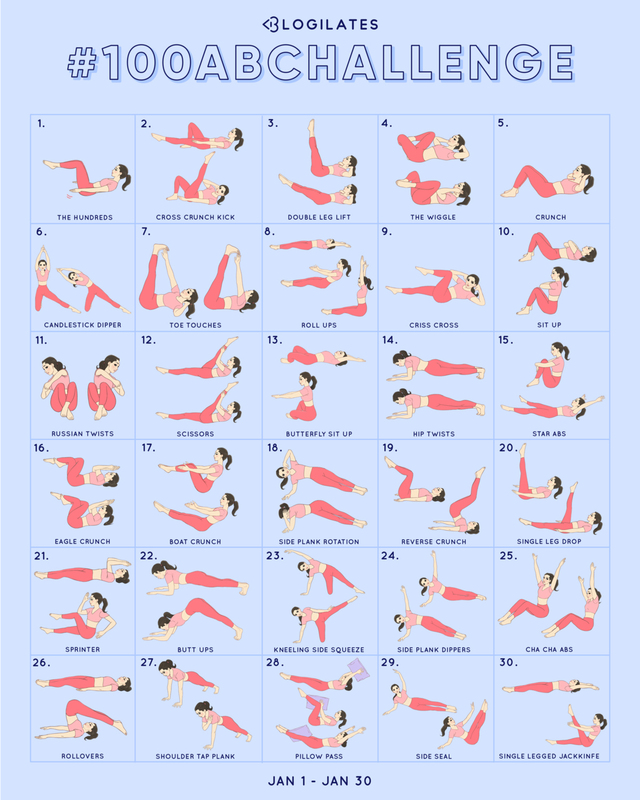 I just started the 100 ab challenge (23 Jan) while doing your beginners calendar ( on day 19) and I am loving these short bursts of intense exercise. I have found myself doing your videos more than 2 or 3 times through each day now that I am getting stronger and more flexible. You are amazing and I hope to be as flexible as you some day. Keep the videos coming and thank you. I have encouraged all my swimmers to take up pilates as a way to increase their joint, core, hip, and overall body strength and flexibility improvement. Is it too late to say I’m in? I’m starting late, but I’ll do it for the full 30 days! I’m doing it. But got started late. I’m in! Can you make a 100 Leg challenge after? I’m in! Up to day 3 and I can feel my stomach muscles getting tighter and stronger. I didn’t think I would be able to keep up but it’s easy to follow along with the videos. Thank you so much Cassey for all your hard work and commitment with this challenge. I would LOVE to see more workout plans or challenges in a video/playlist form as they are so easy to follow along and keep me coming back for more. Just finished my Day 8 and it was so great!! I’m in but ina few days cuz I’m finishing your 30 day challenges. I have 5 months after an C-section. Can I do all these moves? I really like these challenges made into infographics while I do like your videos I also enjoy making my own routines and these are great for when I want to listen to my own tunes. These are also great for when you are traveling or don’t have an internet connection you can just save the picture. Please make more of these. Loving this workout! Anyone have any tips to deal with the soreness though? I’m not used to working my abs every day so it is pretty bad now. I tried stretching but it doesn’t seem to do too much unfortunately. I’m taking the challenge with my sister. I’m already in. I do this every single day! I’m in now, better now than never! I’m in!! Loving it and it’s fun!! I’m in! Let’s do it 2019!!! OMG I”m scared ahahahaha okay here goes nothing! thanks for the motivation! I’m in! I’m late, but let’s do this! I love this but the videos aren’t consistently posted in time. It’s 3:30 pm EST and I don’t see a Day 5 video anywhere. Same thing happened with day 3 for me. The videos help so much with getting it done. Would love to start it from tomorrow!1 I’m IN! I’m in! Just a few days late. I’ll start the calendar today! I’ve only done up to day 3 so far (will do day 4 when I get home from work), but oh boy was my core sore yesterday after 100 double leg lifts. Thank goodness for the beginner modifications! Hello from Belgium ! Beginner here but let’s try this ! I’m in!! late, but in!! I’m late but totally in!! Thank you Cassey! I’m in! A little late! I am in! Started yesterday so I am a day behind but I am in! I’m in, but i have a camp for 3 days without any internet access. Can i just fo a couple of the previous days exercises (to maintain) then continue when i come back? Im in! so excited lets do this! This the first accomplishment I am going to realise this year ! I’m so in ! Love this challenge! Even got my hubby to do it! Can’t you do a 30 day back strengthening challenge? Already started but didnt comment that I’m in ^^ so here it is….I’m In!!! I’m in. Done with day 2. Ready for tomorrow’s challenge. Thanks for sharing this wonderful blog with us. I would love to share this link with my gym addict friend. Started yesterday, my fitness goal is to work on my core, so I’m kicking off the new year with this challenge. Doing this with my boyfriend! See if he would still doubt pilates after this month! I’m in! Already did day 1 and 2! I’m in! And so excited! I’m in! Can only be good for ya. I am in- need to catch up! Looking forward to becoming svelte! Even though I’m a day late… I’M IN…! Ok, I’m in! Looking forward to this Cassey! I have a #NoDaysOff goal this year with a min of 30 min of exercise each day. I just finished my 30 min HIIT workout then wanted to finish with abs so I looked up my favorite ab person online (YOU!) and yessss you have a 100 day ab challenged. Loved the hundreds to start, had to rest my neck a bit at level 5 but made sure to continue engaging my core even when I had to rest my neck down. 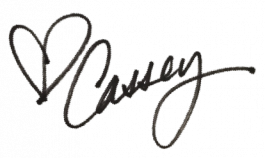 Thank you always for the free workouts Casey! I’m in! Will have to catch up on the first two exercises tomorrow. Bring it on! I’m in and starting a day late so I have decided to do 5 extra reps each day to make up to 30 days worth. I’m in! Just finished January 1! I’m in as I mentioned on YouTube. I think you should collaborate with Kristen Calfee on YouTube. I’m in ! (and my abs are about to be in so much pain) But worth the challenge! I thought I wouldn’t comment, and ‘try’ and do the challenge, but I changed my mind to hold myself accountable. Its public… I’M IN! I’m in! New year New me! I’m IN!!! Gonna do it but with alternations for my diastasis recti. Let’s go ABs!! I’m in let’s do it!!!! I’m in. Bed. But in a few minutes I’ll get out and start exercising. Scared but in….in the past few months I’ve fallen off the exercise wagon. Hopefully this routine helps me jump back on! I’m in!! Love a challenge. I’m in….I think….I’m in! Abs don’t fail me now! LOL! Let’s get this ab party started!!! I’m in.I better mentally prepare for this challenge! I’m in. This is my first Blogilates challenge. I’m in and ready to rumble!!!! Grr!!! I’m in. Let’s achieve this ab guys!! I am in. 💪🏻💪🏻💪🏻 I wish us a lot of fun and strong abs. I’m in! Finished day 1! I am so in!!! Thanks creating a great start for 2019. I’m in! Yay to a new challenge! I don’t understand how they are counting in the video. Supposedly the guy was using a counter but I could not hear it so I just watched and counted every time her hands went up and down and I got to 100 way before they did. What am I doing wrong. I‘m IN!!! Let‘s do it!!!! Im in and thank you for everything you do! I’m in!! Can’t wait, thanks and good luck everyone!! I’m totally in! Going to tell all my POP Pilates peeps about it, too! I’m in with my sister! I’m in! And super excited! Its going to be a very tough month! But how will the moves that require doing them on each side seperately work? Are we switching half way through or doing 100 each? I’m in! Pregnant and all! I don’t know if it is that good to do ab exercises when you are pregnant. You will need fat on your stomach and eat more than other people so that the baby is healthy. I’m pretty sure I’ll regret this during the 100 reps at some point, but I’m in! Let’s do this! Totally IN ! Just hope your vids are ready for me in India as well! :D Rosaanaa and Marshall for sure please!